TORONTO, Aug. 7, 2018 /CNW/ - Sable Resources (TSX.V: SAE) (the "Company" or "Sable") is pleased to announce results from the third drill hole targeting the Margarita Vein in its ongoing 12-hole drill program at the Margarita Project, Chihuahua State, Mexico. Hole M-DDH-18-06 is located between previously released holes M-DDH-18-04 and M-DDH-18-05 (Sable Press Release dated July 26 2018) and confirms vein continuity between these two holes over a distance of 500m. M-DDH-18-06 intersected the Margarita Vein at a depth of 40 meters from surface and returned a weighted average grade of 514g/t AgEq over an intercept of 12.4 meters. True widths are estimated to be 90% of the intercept based on vein to core angle. Detailed drill results, location plan, sections and core photos are available from the Sable website. Holes M-DDH-07, 08, 09, 10 and 11 have been completed and are awaiting results. Similar vein textures have been intersected in these holes across similar widths down to a depth of 100m from surface. M-DDH-12 is currently underway. "We are greatly encouraged by the robust width and grade intersected in hole 6, confirming the Margarita vein continuity for 500m", commented Ruben Padilla, VP Exploration of Sable Resources. "Results for pending holes which test the Margarita structure further at depth and along strike are expected shortly." Silver equivalent is calculated based on based on USD15.50per Oz for Silver, USD 0.95 per pound for Lead and USD1.20 per pound for Zinc. 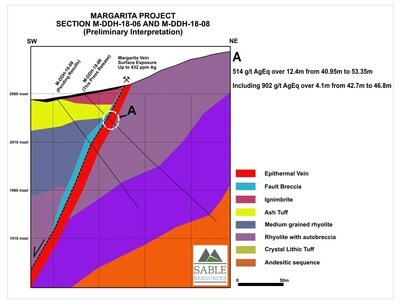 Acquired as part of Sable Resources Upper Level Epithermal Strategy, the Margarita Project is located in the Satevó Municipality in Chihuahua state, approximately 120km SW of the state capital of Chihuahua City, and 110km NNW of the historic Parral mining district. 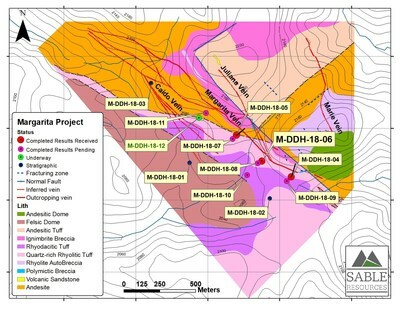 The Project lies on strike with Sunshine Silver Corp.'s Los Gatos Project, which hosts a Measured and Indicated 9.2 million ounce resource containing 178 million ounces silver-equivalent (Sunshine Silver Mining and Refining website published NI 43-101 report titled "Feasibility Study of the Cerro Los Gatos Silver-Lead-Zinc Deposit Los Gatos Project" January 2017). Hosted in Eocene-Oligocene Volcanics, Margarita is defined by 4 veins; Margarita, El Caido, Juliana and Maria on 2 claims totally encompassed by Sunshine Silver. Luis Arteaga (M.Sc) P. Geo. Exploration Manager for Sable Resources and the Company's Qualified Person as defined by NI 43-101 has reviewed and approved the technical information in this news release.